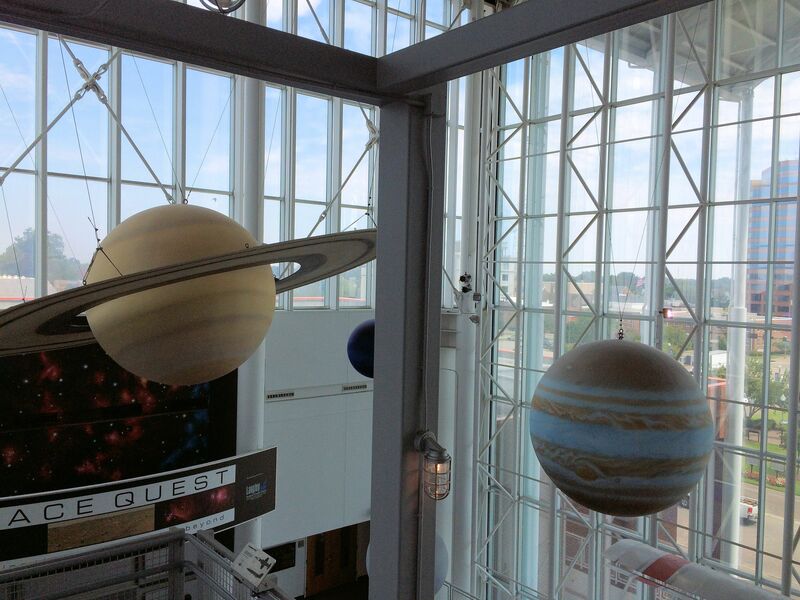 Most recently I visited the Virginia Air & Space Center located in Hampton, VA, one of the fourteen NASA Visitor Centers and Orbiter Locations nationwide and the eighth center I have visited. That leaves six on my bucket list. I was actually in the Southeastern Virginia and Northeast North Carolina area on a genealogical quest, but that is another story. I could not pass up the chance to visit this wonderful NASA Air and Space museum while I was in the neighborhood. The exhibits are well set up with many STEM Camp areas for children. I enjoyed Robots 3D in the comfortable IMax theater. The Wright Brother’s exhibit and 1903 plane replica would probably have been more impressive if I had not been down to Kitty Hawk two days before. The Ham Radio center (my Dad had been a Ham radio operator) where we tried to listen in on the Space Station talking to Kansas City school children. Museum docent Wally Carter was very knowledgeable and obviously enjoys his subject. The Mars rovers located in the Space Quest area. Even though one of the rovers was tipped over on its back and I was unable to right it with the controls, the other was moving around successfully and together they gave me a real appreciation of the difficulties encountered by the real Mars rover and its operators. The Orion Spacecraft Crew Module test module. We were allowed to get up close and look inside. 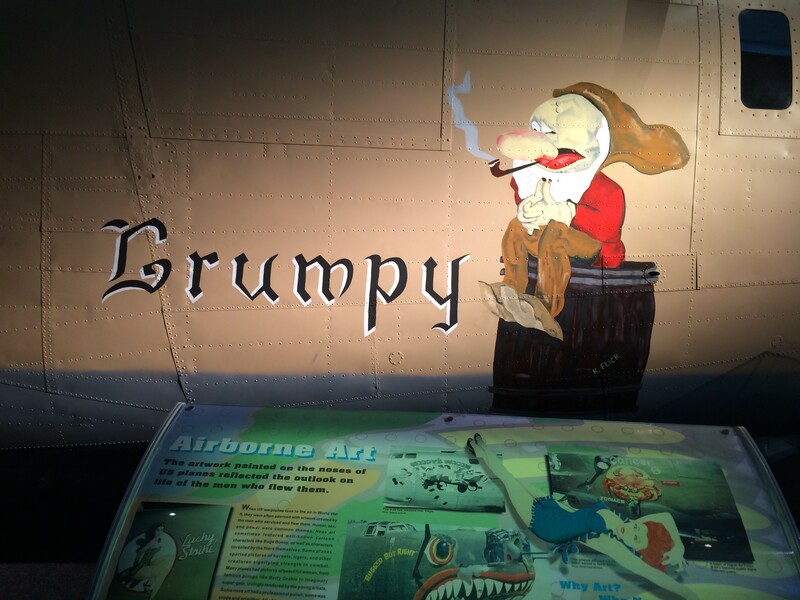 The nose art “Grumpy” from the seven dwarfs airplane nose art. Other fun and informative exhibits are the flight simulator, an F-4E Phantom II, an F-104C Starfighter, a Gemini test module, the Apollo 12 Command Module, and the Solarium. 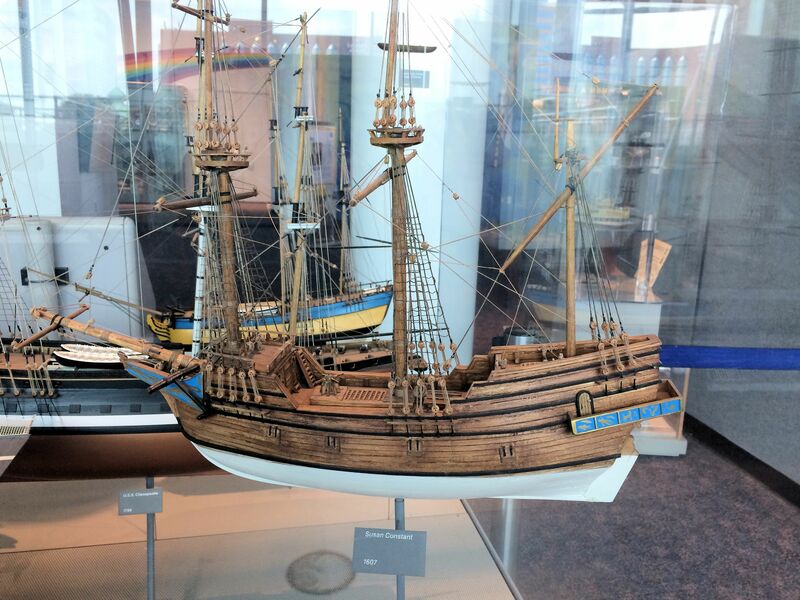 As you enter past the ticket area, there are several display cases with exquisitely detailed models tracing the history of sea and air travel. The Virginia Air & Space Center sits in Hampton Roads, Virginia near Chesapeake Bay where the Battle of the Ironclads in the Civil War took place. 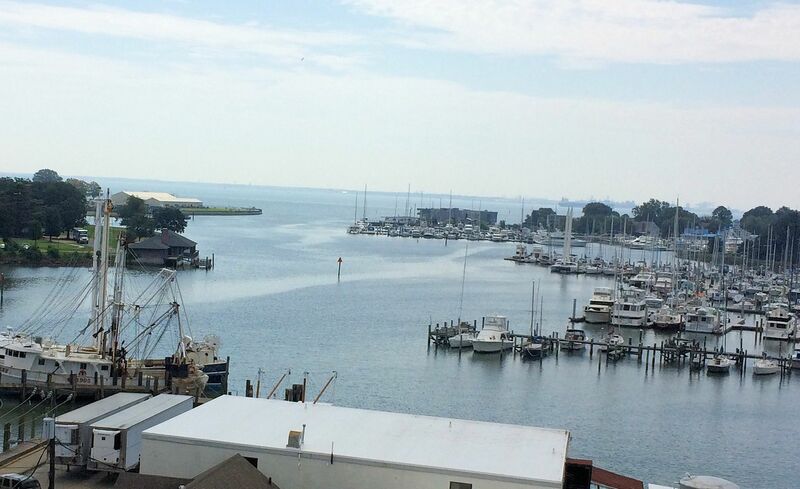 There is an impressive view of the bay where the Elizabeth and Nansemond and the James rivers meet just before they flow into Chesapeake Bay from the museum observation deck on the third floor. Next door to the Virginia Air & Space Center is a small lovely park with benches, a view of the river docks, many historical markers detailing the history of Hampton Roads and the refurbished Hampton Carousel. 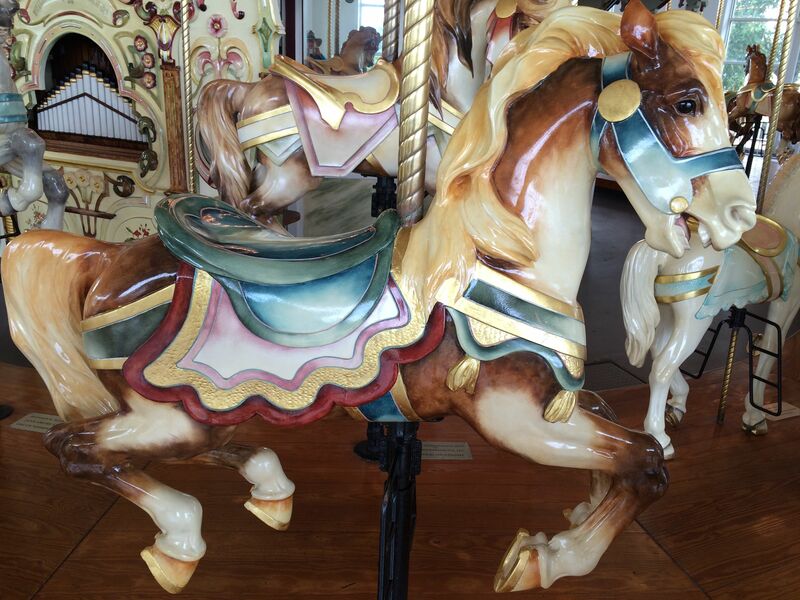 The Hampton Carousel was built in 1920 and was first used in the Buckroe Amusement Park at Buckroe Beach in Hampton. 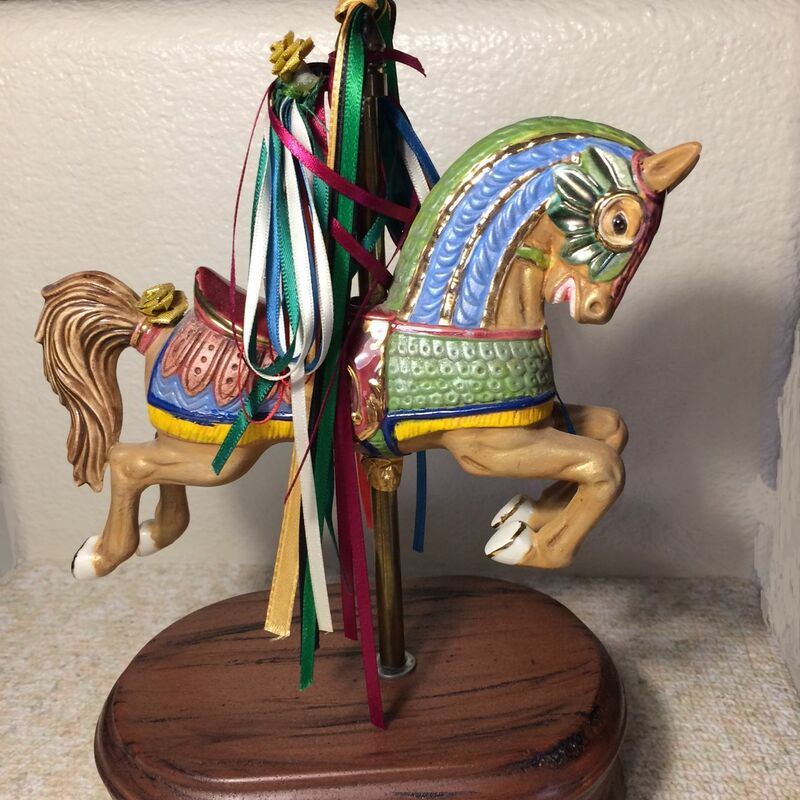 There are forty-eight wooden horses carved by Frank Carretta; while the chariots were carved by Daniel C. Muller. The central equipment housing boasts eighteen unique cut glass shields. And a ride is only $1.00! This entry was posted in Air & Space, Air travel, Aviation, museum, NASA, outer space, planes, space travel, travel and tagged Air & Space, museum, NASA. Bookmark the permalink.